This scene from NASA's Mars Exploration Rover Opportunity shows "Lunokhod 2 Crater," which lies south of "Solander Point" on the west rim of Endeavour Crater. Lunokhod 2 Crater is approximately 20 feet (6 meters) in diameter. Each day's drive by Opportunity sets a new record for longest travel on wheels on a world other than Earth. The previous record holder was the Soviet Union's Lunokhod 2 rover, which landed on Earth's Moon on January 15, 1973. 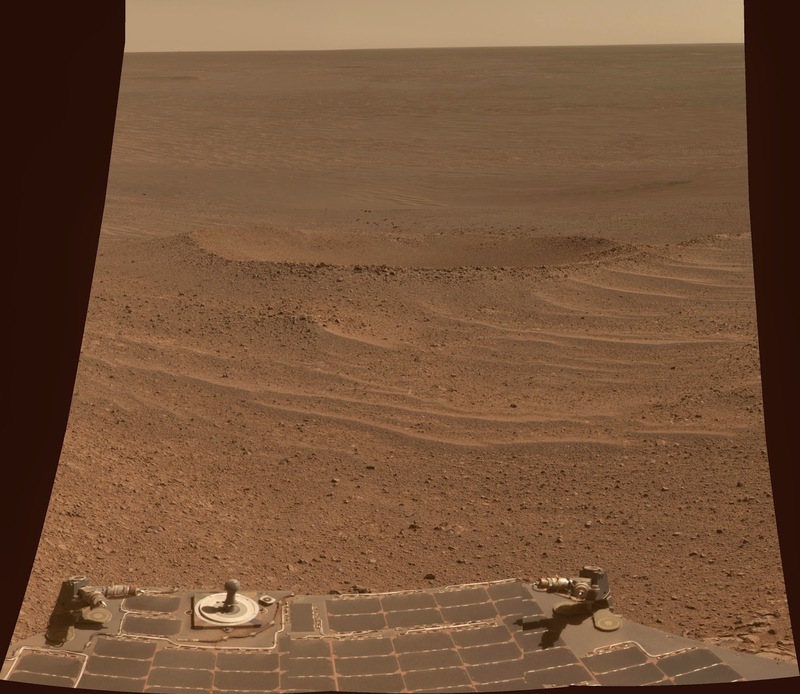 The view was obtained was obtained during Opportunity's 3,644th Martian day (sol) of exploration (April 24, 2014). Part of the rover is visible at bottom, including its rear solar arrays and it panoramic camera, or Pancam, calibration target. The view merges exposures taken through three of the Pancam's color filters, centered on wavelengths of 601 nanometers (orange), 535 nanometers (green) and 482 nanometers (blue). Note: For more information, see PIA18414: 'Lunokhod 2 Crater' on Mars (False Color) and PIA18415: 'Lunokhod 2' Crater on Mars (Stereo); also, see PIA18404: Opportunity's Journey Exceeds 25 Miles, NASA Long-Lived Mars Opportunity Rover Sets Off-World Driving Record, and Mars Rover Sets Off-World Driving Record.